My favorite commentators thus far. Ian Darke and Ally McCoist also did a great job this morning handling the Italy v. New Zealand game. Ian Darke's builds are fantastic (maybe a little sensationalist) which most likely comes from his background in calling boxing matches. Always a good call whether it is he and McCoist or Ekoku. On the other hand Adrian Healey and John Harkes this morning were painful to listen to. Harkes is actually getting to the point where I actually may be worried about his future in regards to working in broadcasting (combined with other recent stories about himself and Eric Wynalda). Healey did make a mistake today confusing Slovakia with Slovenia, but that is minor compared to finishing a wondering stream of consciousness (my man Harkes was fully participating) all the way through a Paraguay goal. 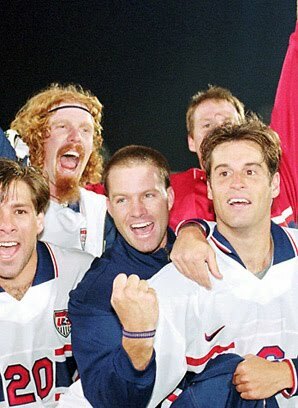 Along with Lalas and Wynalda - Harkes is a player that was larger then life when I was younger. But as I watch more and more of this WC I am realizing that one of the reasons the game can't get off the ground in the US isn't so much soccer itself. It has to do with it's homegrown voices. No info on players, or other leagues, no unscripted insight, flat play calling (or none at all for large swaths of time), and constantly bringing up one touchstone - like the disallowed US goal. As soon as Healey mentioned that this morning Harkes burst in like a mad man, taking over the commentating for a good 2 minutes. It sounded more like a whine. And on top of that annoying whine he has seemed to have developed a strange faux English accent. He's from Jersey. john harkes needs a punch in the balls. it's his fault we bombed in France in 98. poor steve sampson was a patsy. also, martin tyler's call on bradley's goal to tie up the game was awesome "...BradleeeeyyYYY... HAS DONE IT! THE USA ARE LEVEL!" tyler or darke is cool with me. USA winning the group is more then cool. i wish i could have seen that live. best US soccer moment? i need the smitty opinion on that!